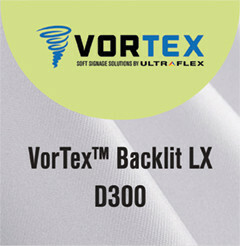 VorTex Backlit LX D300 is a knitted fabric designed for backlit graphics. Includes a brushed backside, which causes a uniform diffusion layer that allows for even light diffusion. Structured print surface allows for rich and uniform saturation resulting in vivid backlit graphics on a wide range of platforms (direct disperse, Latex, transfer and UV).